While Magneto is active, if your opponent has no Villains in the field, he takes 2 damage each time he draws one or more dice from his bag. 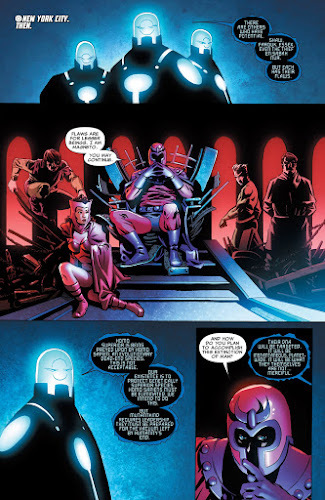 Magneto: Hellfire Club is considered the source of the 2 damage dealt to the opponent. Magneto's ability does not trigger if a player is forced to redraw during the Clear and Draw Step, e.g., Brainiac: Terror of Kandor ("While Brainiac is active, during your opponent’s Clear and Draw Step, you may make your opponent put one die from their draw back into the bag and redraw before they roll."). While Magneto would deal two damage to the opponent during the Clear and Draw Step for drawing dice, all events related to the act of drawing die during the Clear and Draw Step occur simultaneously for the purposes of the game. Thus, if a player had only two die in his or her bag, and had to draw two die and then refill his or her bag before drawing the final two die, the player would only take two damage from Magneto, rather than four, even though the player was physically drawing die twice (before and after refilling the bag). Similarly, Brainiac’s ability triggers as an opponent is drawing die, and is part of the single, simultaneous act of drawing die during the Clear and Draw Step, even though it is a separate physical act. ^ Imprisoned, Uncanny X-Men, #28, 'takes' damage clarification. Wizkids Rules Forum. Retrieved 7-16-2015. ^ Brainiac - Terror of Kandor. Wizkids Rules Forum. Retrieved 8-10-2015. ^ X-Men Vol 2010 #12 Page 24. Marvel Database Wikia. Retrieved 31 October 2016.